Over the last several years, I have become an ultralight camper with a three-season base pack weight of about 8 lb (3.5 kg) and skin out weight of 17 lb (8 kg). I have completed many section hikes on the Appalachian Trail (AT) in all four seasons, and many trips to state parks, with a total mileage of about 1360 miles (2200 km). I am a gearhead, a hammock or tarp camper, and I make much of my own equipment. Manufacturer: W.S. 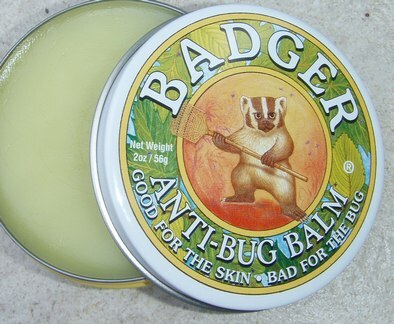 Badger Company, Inc.
Anti-Bug Balm is well described on the manufacturer's website. The attraction of this bug repellent is two-fold. It has claimed effectiveness for mosquitoes and also for ticks and flies. And it does all this without DEET. The box containing the balm had sat on my shaded porch at 95 degrees all day before I found it. The tin was on edge during this time, and I was pleased to find that the balm did not melt in the tin. It was still flat in the bottom of the tin when I opened the package. The ingredients of the balm include: citronella oil (5.0%), cedar oil (2.0%), lemongrass oil (2.0%), rosemary oil (1.0%), & geranium oil (1.0%). These ingredients are contained in a base made from extra virgin olive oil, castor oil and beeswax. This wide spectrum of ingredients may central to success of the balm in repelling so many sorts of bugs. I was fascinated to see that lemongrass oil was included as an ingredient. Just this month I had looked up the ingredients in a new non-DEET repellent and found that the primary ingredient of that product was also lemongrass oil. Several of the other essential oils in the balm are well known are repellents and including them in this repellent seems like a reasonable idea. I opened the tin and was greeted by a strong, but pleasant odor of citrus and lemon. When I rubbed some of the balm on my fingers and then onto my skin, the product in the tin seemed a little oily at first, but once I had rubbed it on my skin, the oil was absorbed quickly and was no longer bothersome. It did not stain the clothes edges next to where I applied the balm. After applying the balm on my exposed skin, I went out to eat with my family. They noticed the strong scent of lemon around me. So did the bugs it seems. While my son had several mosquitoes land on him, the bugs were avoiding me. I guess they don't like lemonade. I had applied the balm on my face, fairly close to my eyes. I was not bothered by any sting around my eyes or lips, like has sometimes happened with other bug repellents. The instructions say that this balm is good for the skin and bad for the bugs. Not much more needs to be said. The instructions do specifically say that the balm can be applied to the face. I went for a morning 3-mile walk in Fredrich Park near San Antonio, Texas, with my son. Temperature began at about 80 F (27 C) and rose to 88 F (31 C). The trail followed several creeks which were wet from the previous night's thunderstorm. We each used a bug repellent - his was a combination sun screen and bug repellent. I was using the Anti-Bug balm. Both worked. We did see others batting at their mosquitoes while we were out. When I got home, I cut the grass and this made me sweat even more. No bug problems. I then took a shower and washed off the repellent with detergent. When I went out to take a couple photos of the balm products in the back yard, I was immediately attacked by many mosquitoes. This gives me great confidence that the anti-bug balm is effective and can be carried as my primary repellent while I am hiking over the next couple months. I like the lemon smell of the bug balm as much as the bugs seem to hate it. I also really like the prospect of using a bug repellent which does not burn when it is next to my eyes. While I have no fear of DEET, I must admit that I have never cared for the smell of repellents that contain DEET. So I am very pleased with this repellent at the beginning of the test. I thank the Badger and BackpackGearTest folks for letting me test the product. Please check back here in a couple months for my Field Report. August 25 - Hill Country State Natural Area, Bandera, Texas. Altitude about 1000 ft (300 m). The afternoon began at 97 F (36 C) and dropped to 78 F (26 C). It was a humid night with a midnight shower. The following day was cloudy and the temperature rose to 95 F (35 C). The bugs were incredibly bad with billions and billions of mosquitoes singing me to sleep all night. I walked 2 mi (3 km) to the camp site and 6 mi (10 km) the following day. September 15 - Hill Country State Natural Area, Bandera, Texas. Altitude about 1000 ft (300 m). The sunny afternoon began at 96 F (35 C) and dropped to 74 F (23 C). The night began clear with a bright moon. Later, after the moon set, the stars disappeared behind a layer of high cloud. The next day was partly cloudy and the temperature rose to 95 F (35 C). The bugs were again bad though not quite as bad as the previous month. The grass, as seen in the photo above was a haven to mosquitoes. No one had cut the grass all season, or even used the backcountry site. The grass was nearly as tall as my tent and the song of the bugs rose from the grass as soon as the sun began to go down. This was the height of fire ant season, and I was stung several times, including one memorable incident in the middle of the night when I made a nature call in my bare feet. For this trip, I carried my pack while mountain biking to the campsite, just about croaking in the heat. The next day, I explored most of the trails in the park on the bike. October 13 - Lost Maples State Natural Area, Vanderpool, Texas. Altitude from 1800 - 2200 ft (550 - 670 m). For my one mi (2 km) walk to the camp site, the temperature was 85 F (29 C). The night was super clear and moonless. The temperature dropped to 65 F (18 C) and there was a bit of a breeze flapping the tent around beginning in the wee hours of the night. I carried my pack for 12 mi (20 km) of backpacking the next day. November 16 - Government Canyon State Natural Area, Helotes, Texas. Altitude about 1000 ft (300 m). The afternoon temperatures started about 80 F (27 C) and dropped to 50 F (10 C). The night began clear and windy. The temperature dropped after the sun went down under the clear sky. About the time that I retired into my hammock, clouds were moving in. During the night, the temperature rose as did the humidity. It sprinkled on and off for the second half of the night. For bug protection, I did not use the mosquito net over my hammock, only using some balm on my face and ears. I heard a few bugs overnight, but did not get any bites, other than a couple fire ant bites from moving wood to my fire pit. Other than the overnight hikes mentioned above, I also used the Badger Anti-Bug Balm on about 15 lengthy day hikes across the summer. On many of these hikes, the bugs were quite bothersome. I loaned out my anti-bug balm a number of times to folks that had brought no repellent with them into the woods. I also used the balm for several picnics, for mountain bike riding, and for visits to amusement parks across the summer. Badger Anti-Bug Balm works. I admit that I had my doubts that a natural oil (lemon grass and citronella) based mosquito repellent would protect me, but this one really did. For hiking in badly infested parts of the woods, and with constant sweating in temperatures as high as 100 F (34 C) I found that I had to apply the balm every couple hours. But just as soon as I had reapplied the balm, the bugs stopped dive bombing my ears and my neck. For the times that I noticed others having problems with deer flies, use of the Badger Anti-Bug Balm kept those flies away as well. Though I did a lot of hiking in waist high grass during the summer, I never had any chigger attacks. Others around me said that they came back from the same hikes with lots of chiggers. I never found a tick climbing up my legs or anywhere else for that matter. 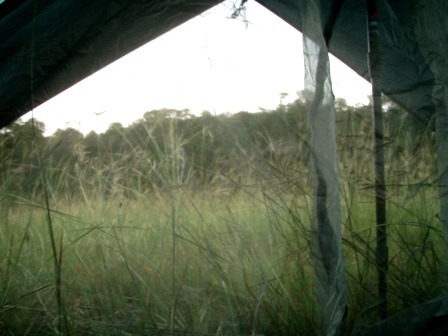 When camping in the very buggy conditions described above, I found that I finished the weekend trips with only one or two mosquito bites, no chigger bites, no ticks, and best of all - slept without worrying about waking with a bug-bite swollen face. I found that I could apply the balm lightly to my sweaty hair, and this kept mosquitoes from biting me in areas where my hair is thinning. When I occasionally noticed bugs biting me through a tee shirt, a light application on the shirt stopped the intrusion and kept me safe for hours. I often applied some of the balm on the top of my socks when I was treating my bare legs. Though Badger is not advertised for fire ants, I did not notice that these nasty little creatures much minded the bug balm. They climbed right onto hands and feet that had very recently been treated with the anti-bug balm. Maybe they liked the citrus scent. I did notice that the balm went on very well, even when I was drenched with sweat. It seemed to stick to my skin under the layer of watery sweat and worked for quite a while, longer than for many other bug dopes I have applied in the past. The balm was physically quite stable in its tin in warm temperatures. Only one time during the summer did the balm melt in its tin. That was a time when I left my pack sitting in the hot sun. Even then, the can did not leak and it was quite easy to warm the can near a campfire, so that the balm melted back into the bottom of the tin making it easy to use again. Though I was also testing a foot balm by Badger, I occasionally used the Anti-Bug Balm as a blister preventative on my feet, and it worked just fine. I used it several times as an aid to reduce chafing between my legs. Again, in this unadvertised use, it worked well. It was not irritating to sensitive skin, and kept my skin feeling well even when hot. Though I used the Anti-Bug Balm for four months with sometimes daily applications, I only used up about half of the balm. This is an answer to bug protection that is worthy of carrying on long trails, like the AT, when running out of a critical supply can be a real problem. The Anti-Bug Balm keeps mosquitoes and chiggers and ticks and deer flies under control. It smells a heck of a lot better than DEET products. It goes on sweaty skin and sticks to the skin instead of washing away in sweat. I thank Badger and BackpackGearTest.org for selecting me for this interesting and rewarding test.